I felt badly that the kid’s quilt only won one ribbon when there were 6 of them that worked so hard on it. 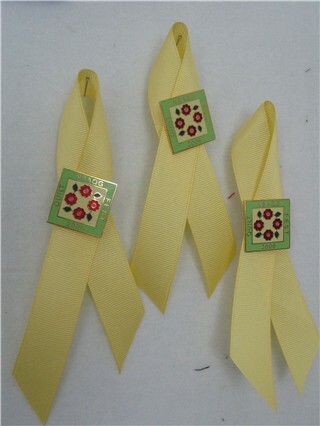 So I got some ribbon and some pins from the show and made each a little ribbon. They were super easy to make and I’m hoping will have a certain WOW factor for the kids. I’ve done the piped binding on my ‘Oh! to Dance With a Dolphin’ quilt. It was one of the things that the judges commented on that made it outstanding. I cut the corners rounded on that quilt to keep from adding bulk at the corners with that technique, & used bias binding. The ribbons for the kids are a very nice touch. It’s always a dilemma on the group quilts, who gets the ribbon. I usually have ended up giving it to the person who has none,& have made several small ones as thank yous to contributors on a charity quilt, that won 1st place. I just posted about piped bindings on my blog–what a coincidence. Yours looks great. Don’t try to turn the corners with the piping. Just cut it off at the edges and let it overlap. You can pull out a little bit of the cord and cut it so that the bulk is less. Probably that’s what your directions say, but just in case. 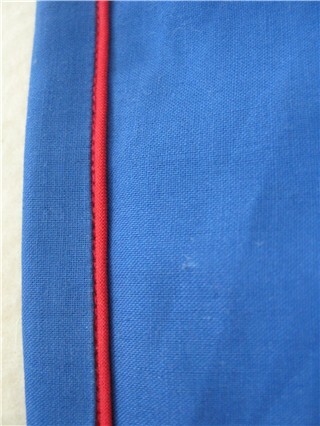 Love that piped binding, to look at, not to try. Those kids are so fortunate to have a teacher like you.